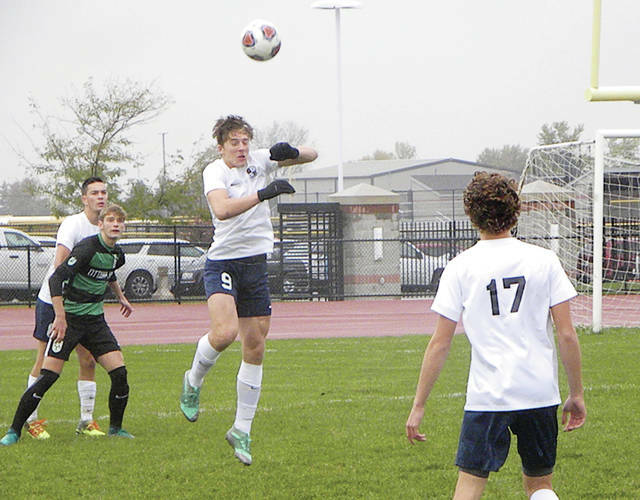 Elijah Zimmerman of Archbold goes for a header in a tournament game against Ottawa Hills this season. The junior was one of three Blue Streaks to be named first team all-district. Eli Grieser of Pettisville handles a ball in a game against Liberty Center. He was honorable mention all-district in Division III. 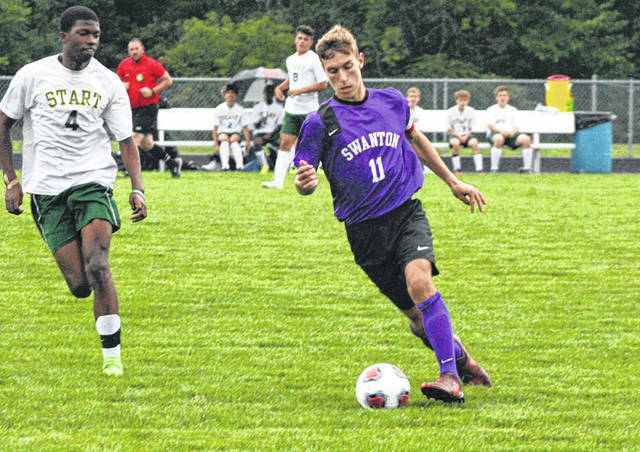 Riley Hensley (11) was recently named first team all-district in Division II for Swanton. 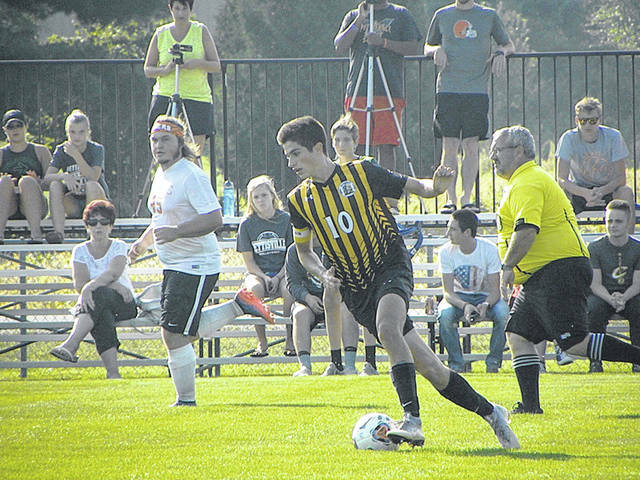 Area boys received honors when the Northwest Ohio Scholastic Soccer Coaches Association announced their all-district teams recently. In Division II, Riley Hensley of Swanton was selected first team all-district. Also for the Bulldogs, Donovan Avalos, Zach Schaller and Cole Mortemore were honorable mention. Archbold’s Josh Kidder was named player of the year in Division III. Andrew Hogrefe and Elijah Zimmerman were also first team all-district for the Blue Streaks. Chase Kohler of Archbold was on the second team. For Pettisville, Detric Yoder received first team honors. Eli Grieser, Canidate Vickery and Mitchell Avina were honorable mention for the Blackbirds. Tyler Manon, jr., Bryan; Jim Aquino, sr., Celina; Jon Weisgerber, sr., Defiance; Draek Littler, jr., Elida; Landon Bartlett, sr., Kenton; Ryan McGuire, sr., Lima Shawnee; Jacob Miller, fr., Lima Shawnee; Braden Wagener, jr., Maumee; Trey Cruz, jr., Napoleon; Noah Svanberg, sr., Otsego; Ethan Rose, sr., St. Mary’s Memorial; Riley Hensley, jr., Swanton; Mason Orians, sr., Toledo Central Catholic. Player of the Year: Landon Bartlett, Kenton. Josh Kuehne, jr., Celina; Corey Steyer, sr., Defiance; Caleb Jones, sr., Elida; Isaac Mendez, sr., Kenton; Brenton Brock, Lima Bath; Ethan Swallow, sr., Lima Shawnee; Landon Hoehn, soph., Lima Shawnee; Sam LaChapelle, sr., Maumee; Kyle Robinson, sr., Maumee; Spencer Pope, sr., Otsego; Howie Spencer, sr., St. Mary’s Memorial; Brett Bishop, Toledo Central Catholic; CJ Buchele, jr., Toledo Central Catholic; Jaidyn Thiel, jr., Upper Sandusky. Andrew Hogrefe, sr., Archbold; Josh Kidder, sr., Archbold; Elijah Zimmerman, jr., Archbold; Luke Young, sr., Bluffton; Orry Killam, sr., Liberty Center; Parker Strauss, sr., Liberty Center; Mujahid Abdel-Ghani, sr., Maumee Valley; Ethan White, sr., Ottwa-Glandorf; Kevin Hileman, sr., Ottawa Hills; Dylan Schreder, jr., Ottawa Hills; Drew Hoffman, jr., Ottawa Hills; John Kight, jr., Ottawa Hills; Detric Yoder, sr., Pettisville; Coby Miller, jr., Riverdale; Ian Teague, jr., Rossford; Nate Gregory, sr., Van Buren; Nick McCracken, soph., Van Buren; Hunter Stone, jr., Van Buren. Chris Reyes, sr., Ada; Bryce Wilcox, jr., Allen East; Chase Kohler, jr., Archbold; Dakoda Clymer, sr., Bluffton; Jesse Montel, sr., Bluffton; Konnor Okuley, sr., Continental; Jacob Stewart, sr., Genoa; Matt Kehres, jr., Kalida; Evan Roebke, jr., Kalida; Cameron Schroeder, sr., Liberty-Benton; Brody Bowman, sr., Lima Temple Christian; Aiden Searfoss, sr., Miller City; Joseph Baende, sr., New Knoxville; Nolan Unterbrink, sr., Ottawa-Glandorf; Drew Fisher, jr., Ottoville; Max Stewart, sr., Rossford; Spencer Fedderke, soph., Toledo Christian; Thomas Piccirillo, sr., Van Buren.